The Stanley Park Information Booth is a place where you can, obviously, get information about Stanley Park. You can pick up a map of Stanley Park, get directions and flyers for other Vancouver attractions. The information booth has a small concession stand and washrooms. 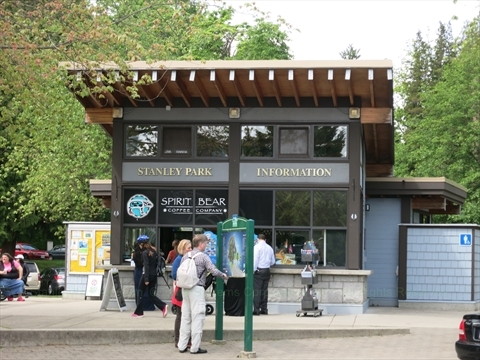 Where is the Stanley Park Information Booth in Stanley Park? The Stanley Park Information Booth is located just off of Stanley Park Drive and the Stanley Park Seawall just after the Royal Vancouver Yacht Club. Nearby is the Painter's Circle and the Old Polar Bear Compound.